Mister Adisson Winfield Croes built this beautiful house in the twenties especially for his wife. Avenida Milio Croes (Fergusonstraat) was at the time still a dirt road, away from the city center. The family lived in the city during the week. When the children of the family were married and had children of their own, the house became a guesthouse for the grandchildren too. The house was built by mister Dada Picus. The architecture shows clear influences of Latin American neo-baroque style. Mr. Picus was based on the design of a house in Cartagena Colombia for the design of this house. The house is set on a basement that was used as a storage place, and to put the rainwater tanks. When Fergusonstraat was connected to the road leading to San Nicolas this became a very busy route, so the family decided to put the house for rent. 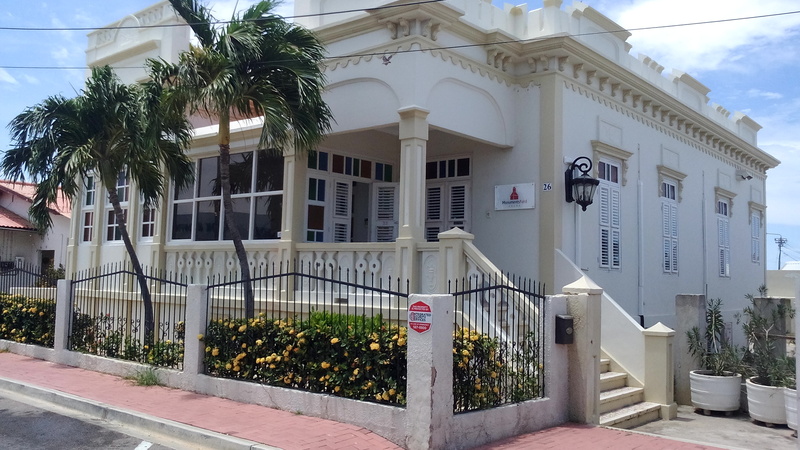 This beautiful house currently houses the Stichting Monumentenfonds Aruba.